No, it's just that I wouldn't be able to act goofy and silly, throwing cream pies at everyone who stumbles upon the thread. THAT kind of rational/proper behavior. Really impressive how you deliver so varied characters, they really are very diverse. What really gave me a good feeling about Regor was the casual insults delivered, and what's more how much it reminded me of the narrator in Dungeon Keeper. I look forward to more of your work, and can only hope you can put your stamp on many more characters in the future. #DEplease i so want to hear this now. So so much. Not going to repeat what everyone's been saying. 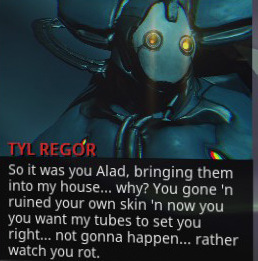 Tyl Regor was what made the Tubemen event. 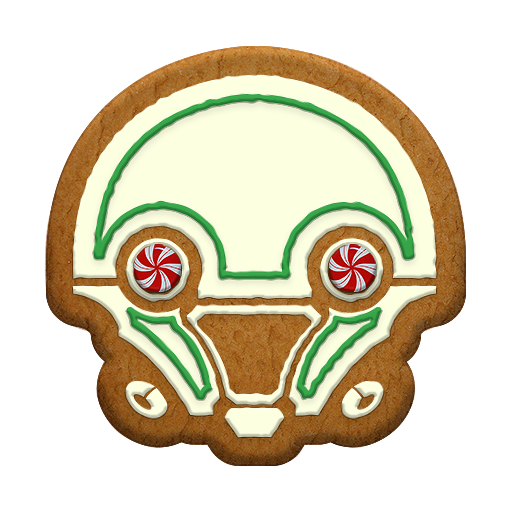 Since we're here: Excellent job with Nef Anyo. Very good characterization/portrayal. He's exactly what he's supposed to be. HA HA HA!!! 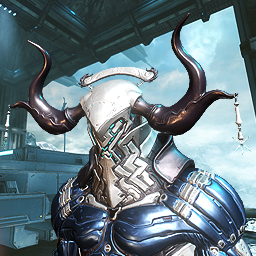 Love the swooning Warframes one!! Thanks for the kind words and images. 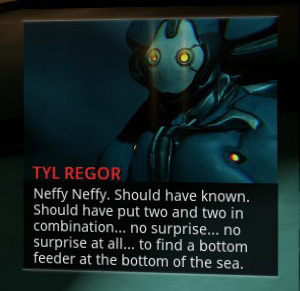 And I'm glad you can't stand Nef Anyo. I meant rational behavior for a senpai, which translates to not noticing people. 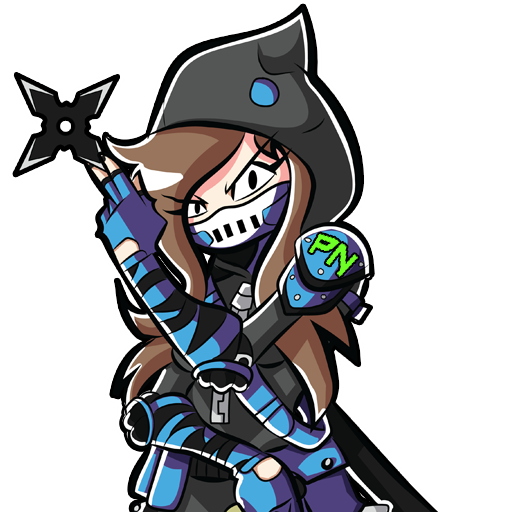 Fun thing, you can think of the most epic and greatest lines for a charater but, 80-95% of it gets chopp out or censor because of well everything. 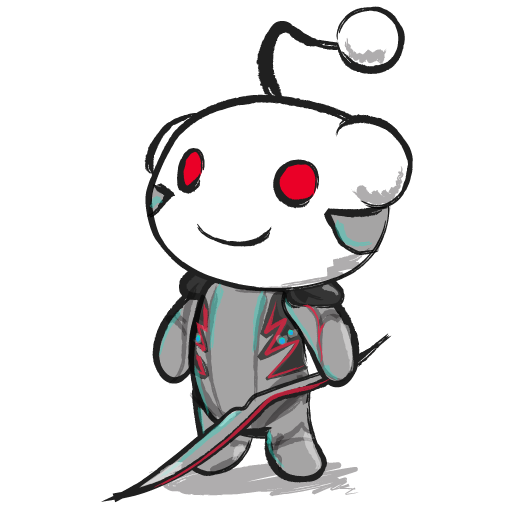 Shame really would love to hear more fun insults and stuff. But I resepct it with stride haha! 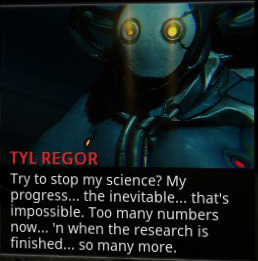 i actually just have one tiny qualm... the line where tyl goes "Try to stop my science? My progress? The inevitable? That's impossible. 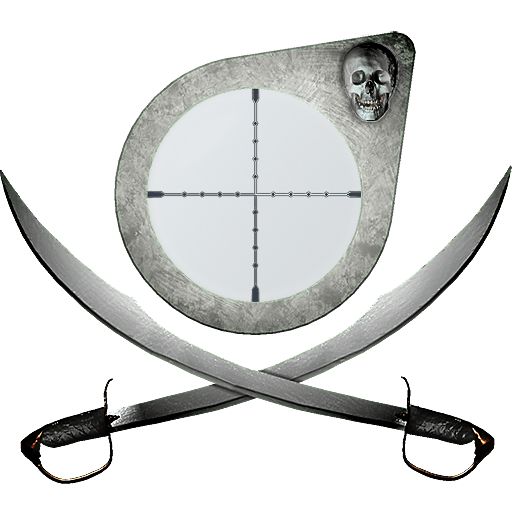 Too many numbers now... and when the research is finished... so many more." 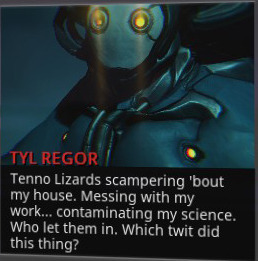 I hate to revive this for personal reasons, but a while back in one of the many, MANY threads praising this man's glorious work someone linked a video image of a closeup on Regor's transmissions. Can anyone find that and link it to me? I'm asking for a good cause. Found these on tumblr posts. Cheers to you man. I'm sure you deserve some greedy milk for breakfast if you don't mind. 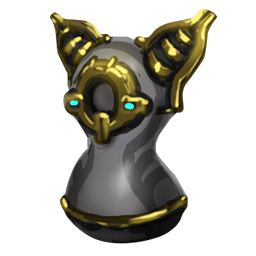 But aside, just like an echo to everyone, your voice acting have made Regor a favorite in Warframe. 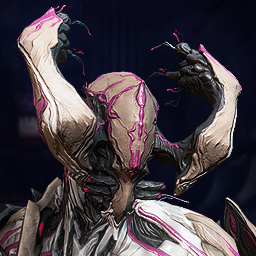 As much as I would like to wait, the anticipation of more of your voice in Regor and Nef is much awaited. 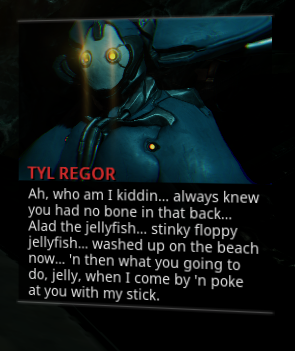 Make us swoon with lines that'll show how Regor is not just a half-mad-scientist but also a half-witty one too. Oh, that was you ? You have a nice voice acting man, the first time I heard this I was like "wtf ? 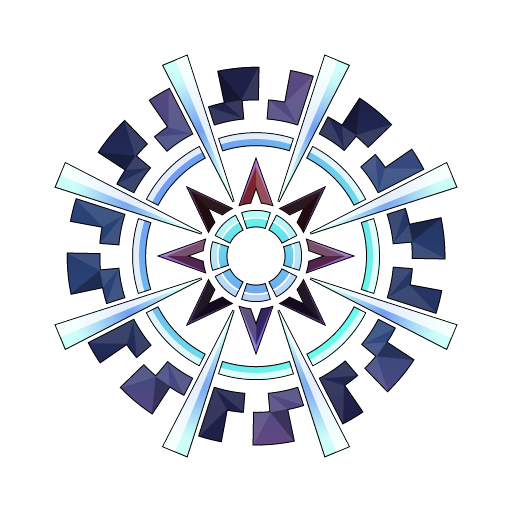 the first boss who is not annoying ? and he sounds... funny ?? what is wrong ??" 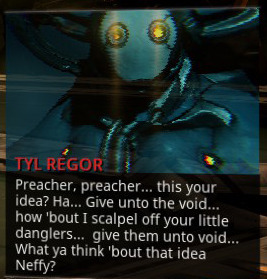 Tyl Regor is now by @(*()&#036; far the greatest boss in the game (hand down, and not even close to the others). You made him untertaining, even after a lot of runs. Hello Tyl R...., I mean Lucas! Great work Sir, your voice was THE highlight of the mission! Thanks! "I'm very exited now. 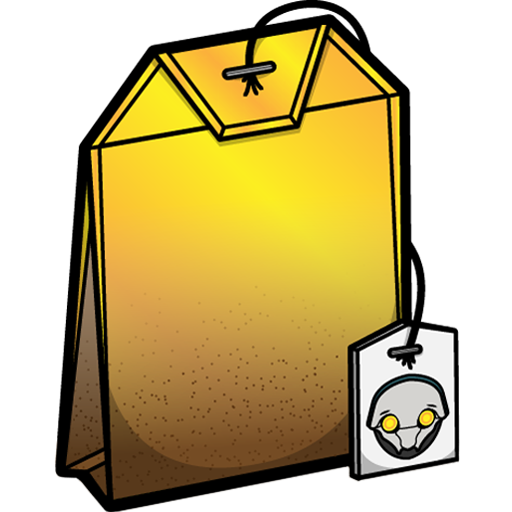 The anticipation, ooh..."
Tyl Regor is amazing! Your voice is amazing! Thank you for helping to create such badass character with your voice. 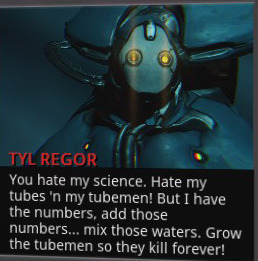 I hate your tubes, 'n your tubemen, but your voice is great! 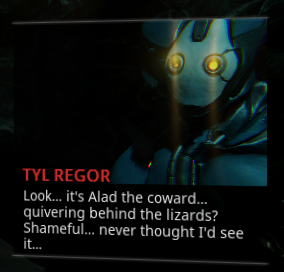 I know Megan, of course Rebecca, and DE_skree do a lot of acting for the game, so had just figured it was all done in-house :P I like all the voice acting in the game honestly, except I'm not a huge Ordis fan hahah (not because the voice acting is bad...just don't like him talking to me all the time in my ship, lol). You did an amazing job with Tyl's voice! He's definately an unforgettable character now. Well done! 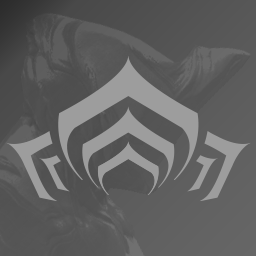 Anyways, absolutely stellar performance as Regor! By far my favorite voice over in the entire series!